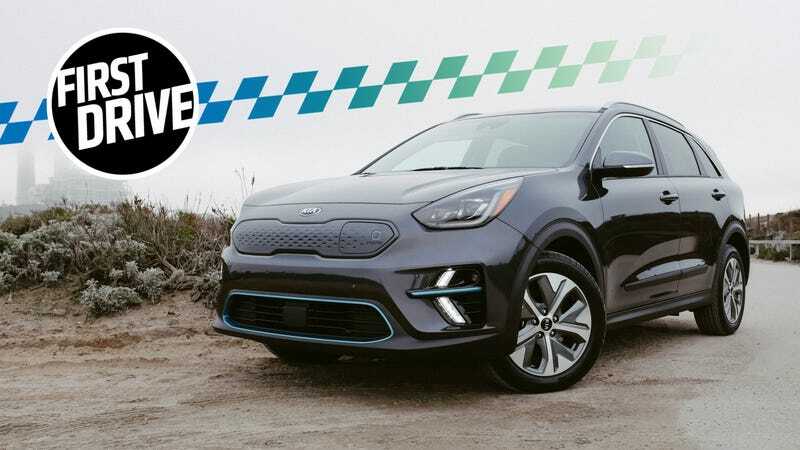 If you’re tired of electric cars that seem like they’re trying too hard to stand out, the 2019 Kia Niro EV goes the opposite direction with humble performance, practical packaging and the styling of a middle-aged Kia Soul. 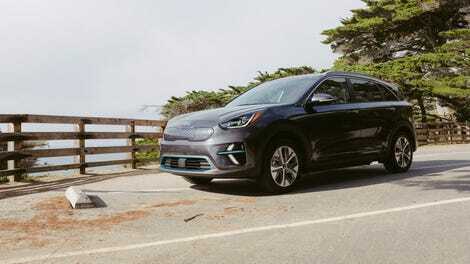 The 2019 Kia Niro EV can be thought of as the respectable, normal, casual electric crossover meant to build on the success of the old electric Kia Soul, but offer a little more performance and practicality. Funnily enough, the hardware underneath the Niro EV will be the foundation of the second-generation Soul EV down the road. But it also has to take on competition like the Tesla Model 3, Chevy Bolt, Nissan Leaf, and even some in-house competition from Kia’s sibling rival Hyundai, which sells the Kona EV based on the same platform as the Niro. The Niro is the bigger sibling to the Kona—it’s 7.6-inches longer, with four more inches in the wheelbase, and 0.2-inches wider, which all builds up to 2.5 more cubic feet of space for passengers and cargo. The Niro is also available as a hybrid or a plug-in hybrid model, all of which share a platform—the EV just loses the gas engine, throws an electric motor in its place, and gets a bigger flat battery pack under the seating area. The Niro EV gets the same 64 kWh battery pack as the Kona, but a lesser range of 239 miles on a full charge because of the car’s bigger size. That range is comparable to the EPA-estimated 238 miles the Bolt is supposed to get with its 64 kWh battery, and more than the 220 miles of the “Standard” Tesla Model 3. It’s front-wheel drive, with a 150 kilowatt electric motor that spins out 201 horsepower and 291 lb-ft of torque. As I mentioned before, the motor, charging unit and HVAC hardware take up the space under the hood, so you don’t benefit from any frunk storage whatsoever from this EV. The Niro comes with a CCS (Combined Charging System) port in the grille, which is an upgrade from the CHAdeMO port on the old Soul EV. Charge times are under 10 hours to a full charge using a common level 2, 240-volt, 7.2 kWh charger, or 80 percent capacity (around 190 miles) connected to a CCS DC-fast charger in 75 minutes, according to Kia. It’s available in two trims—EX and EX Premium—but Kia hasn’t announced pricing just yet. We were told to look at the Kona EV’s pricing and “infer,” so between those two trims, it could be priced to start around $36,000 before state and federal incentives. Kia hasn’t run out of the full $7,500 federal credit like Tesla has (and Chevy soon will), so factor that into your decision making if you’re worried about optimum value. The EX Premium model I spent time with gets LED headlights, park distance warning, a sunroof, an 8-inch touchscreen, 8-speaker Harman Kardon sound setup, LED interior lighting, a heated steering wheel, auto-dimming mirror, and mood lighting inside with six color options. Also standard on all Niro EVs is Apple CarPlay and Android Auto, wireless smartphone charging, forward collision warning and avoidance, lane-keep warning and assist, driver attention warning, bling spot warning, rear-cross traffic warning, and “Stop and Go” smart adaptive cruise control. It will go on sale mid-to-late February in 12 states: California, Connecticut, Georgia, Hawaii, Maryland, Massachusetts, New Jersey, New York, Oregon, Rhode Island, Texas and Washington. I still haven’t gotten over the energetic joy of driving a torque-y electric car, and the Niro is no different. All of the torque and power mapping is done in a way to prevent you from doing anything even near the edge of crazy—attempt to launch the car and, no matter how hard you try, you’re only going to get a casual rollaway before the car gets the message and offers you the power you intended to translate into tire smoke. So as far as general tomfoolery, this feels a lot like any other regular, low-powered front-wheel drive vehicle. At highway speeds, though, there’s a satisfying squish of power when you want to get around all of the people that still brake for highway curves, living out their weird individual realities cruising casually in the left lane. You can get from 60 to 90 mph in an alarmingly modest but efficiently rapid manner. It shares a platform with its hybrid siblings, but the Niro drives like a fully-electric car. It’s nothing explosive like a high-powered Tesla, and few marks below the performance of the Jaguar I-Pace, but its competitive alongside the Bolt or Leaf, maybe even an edge better than the short-range Leaf. Its ride is weighty and tips toward firm, but it’s overall a fairly smooth journey. You also get four different drive modes, with Sport, Normal, Eco and Eco Plus if you hold down the drive mode button long enough. Eco Plus limits your speed to just 60 mph, and all of them have individual braking regeneration levels and climate control adjustments. The rest of the drive modes seemed to impact range by a couple of miles, in the negative for normal and sport, obviously, but the brake regen intensity could be set to four levels by the driver with the pedals behind the steering wheel. The driver display screen was fairly good and well laid-out, and if you have a phone that can charge wirelessly, the space under the dashboard is capable. If not, there are two USB charge ports and an additional USB media port, along with a 12-volt socket. There’s also a whirring, winding external noise that Kia claims is for pedestrian awareness. It sounds like the motor whining, but in an appealing manner. At a higher constant speed it’s quiet but not silent in the cabin of the car, but under acceleration and braking it becomes very apparent. I could see it getting on somebody’s nerves if they weren’t listening to the radio. Between my co-driver and I, neither of us come anywhere near six-feet tall, but sitting in the back seat my knees had a good couple of inches before I risked skinning the back of the front seats. As for cargo, there’s plenty of room in the back. A charging cable comes with the car and is stored under the floor in the rear, and the surrounding area seems at least partially engineered for some small hidden, under-floor cubbies. There were also two little storage areas on either side of the cargo area that had a top you could pop on and off, and there was also a retractable cargo screen to cover everything in the back if you’re worried about people peeping. Perhaps the best quality of the Niro EV is that it just feels like any other common front-wheel drive compact crossover. It’s for the person who wants to buy an electric car but doesn’t necessarily care about all of the weird styling flourishes or compact limitations of the other cars in its class. As I said, the Niro is affordably comfortable, but that affordability really shows in most of the interior materials. I don’t mind cloth seats, but the issue comes down to the expanse of hard plastic that stretches from the footwells, up the doors and onto the dashboard. Some of the button layout is awkward too, like having the heated steering wheel button on the passenger side of the center console, or having an “up or down” rocker button for directing air flow, which could have just been one button. The plastic covers of the 12-volt socket and the dashboard USB charger are awkward, as is the hanging plastic cover for the SD card slot. Kia photo because mine were out of focus! The navigation touch-buttons are also frustratingly hard to identify or locate, and while the system is fast and the navigation worked effectively for the duration of the trip, the design of the map and the odd yellow font color looked extremely dated. On the road, the wind noise is kept to a minimum while road noise is substantial, but not overwhelming. The lane-keeping system that pairs with the adaptive cruise control setting was not confidence-inspiring on many of the highway curves, and even after significant input from the driver, you can still feel the torque of the computer trying to manage the steering through the wheel. The Kia Niro EV is comfortable, fairly practical, affordable (and looks it, for better or worse), well-equipped, punchy to drive and otherwise mostly anonymous to live with. It’s one of the better packages for someone shopping for an electric second car for the family. The best way to describe it is, well, it’s the Kia of electric cars. Punchy to drive and doesn't try too hard. The high asking price of EVs still conflicts with the quality of their interiors. Comfortable, capable and practical, if just a little too humble both inside and out.